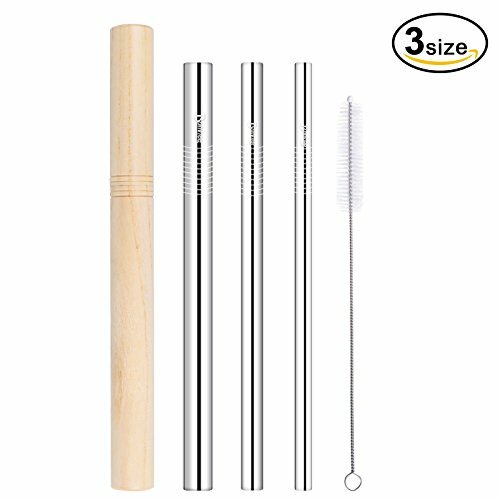 【 3 Size Meet Your Needs 】 Set of 3 reusable metal straws straight are with 8.5\" length, 0.47\"/0.31\"/ 0.24\" diameter for 20 OZ Yeti, Tumbler, RTIC cups. Stainless steel straws wide perfect for drinking cold beverage, smoothies, Milkshakes, cocktail, fruit juice, milk, sodas, coffee, tea and any drinks. 【 Safe Food Grade Material 】 Made of rust and scratch proof-18/8 food grade stainless steel material with No chemical, Non-toxic and BPF free, and won\'t rust, corrode, stain or bend. These reusable stainless steel straws are well-made and sturdy enough for long time use. Totally Healthy and Eco-Friendly. 【 Smooth Edges Design 】 The mouth of stainless steel metal straws is thick and with rounded end, not sharp and will not hurt mouth, we focus on details to make it perfect to ensure your safety. Suitable for kids, children and adult. 【 Portable Travel Wooden Case 】 Straws stainless steel come with a portable travel wooden case made from walnut, so can be carried wherever you go. Great for outdoor picnics, hiking, trips, family party and office use. Packing design perfect for any occasion. 【 Easy to Clean & Dishwasher Safety 】 Stainless steel straws straight come with cleaning brushe which are long enough to wash the whole straw to ensure that every inch of the Stainless Steel Straws Set remains spick and span. Also can be cleaned in the dishwasher.